I've had this boat for a number of years and have held off making it due to both its size and that I like to place my models in a diorama of some description. Usually I take on smaller models and build them into small "snapshot" dioramas or vignettes. I will be the first to admit that I don't usually go for a water based dio because of the expense of the water products and the difficulty in using them. I do however like to take on a bigger summer project while I am on my annual leave from my job. After a lot of thought I realised that I could use the boat itself as a diorama base and use the figures on board the boat to create the diorama. This will cut down the expense and size of the diorama, but still provide me with a pleasing model at the end of it. Once I was happy with the overall look of the interior I moved onto the weathering of the model which was a series of washes in oil. The first a black pin wash, the second an overall white wash to "age" the olive green paintwork and finally a selected wash of burnt umber in various spots across the boats hull and other exterior fixings. I was very careful not to give the impression of rust on any of the boats parts as this type of boat was almost exclusively manufactured from fibreglass; therefore no rust. As a final touch washed the boat in powdered earth suspended in a very dilute mixture of PVA and water to represent the mud that would accumulate across the entire deck area of the boat from the crew. The "theme" of the diorama is one which depicts the PBR in action. 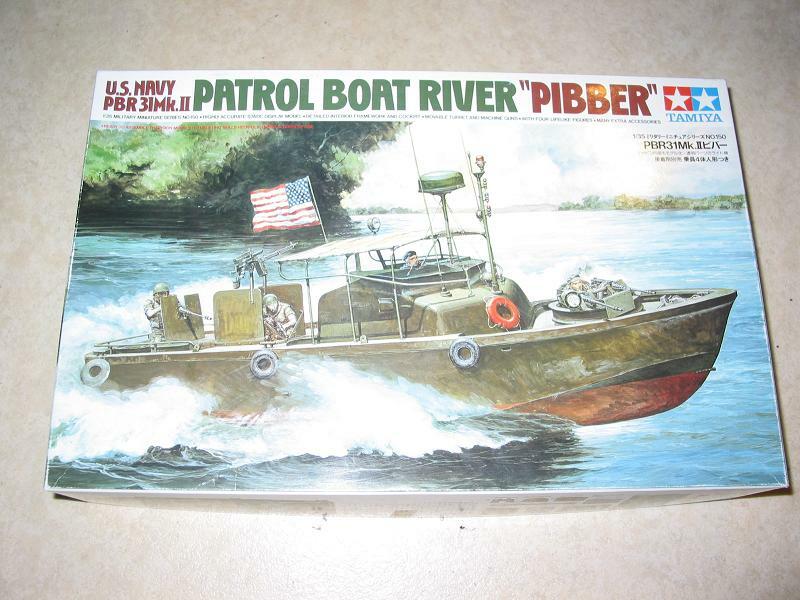 I (hopefully) want to show the crew in a firefight with the enemy on the riverbank following one of the crew being mortally wounded on the boat. The crew is a combination of a dragon figure set that I had in the "stash", some of the supplied crew and Legend resin heads on some of them. I only needed to alter the pose of one of the figures; the crewman I was going to depict being shot while dropping off a small special forces team in a hostile part of the country. As far as mounting the boat was concerned, I had become increasingly unhappy with the supplied stand as a final way to display the boat. Fortunately I remembered salvaging a display base from the skip in work. It had been used to display an aircraft part that was no longer required. A quick rummage around and I found what was to turn out to be a perfect size base to display the PBR. I drilled the base in two locations, mounted some plastic tube and then cut some brass tube to sit over the original tube and provide a neat "stop" for the boat to sit on.